White dwarfs are the burned-out cores of stars like our Sun. 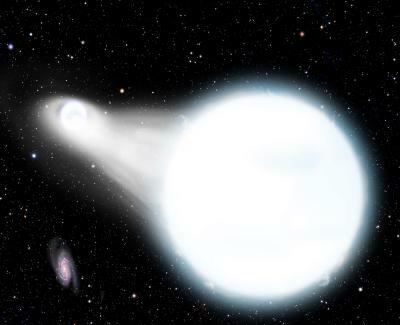 Astronomers have discovered a pair of white dwarfs spiraling into one another at breakneck speeds. Today, these white dwarfs are so near they make a complete orbit in just 13 minutes, but they are gradually slipping closer together. About 900,000 years from now – a blink of an eye in astronomical time – they will merge and possibly explode as a supernova. By watching the stars converge, scientists will test both Einstein’s theory of general relativity and the origin of some peculiar supernovae. The two white dwarfs are circling at a bracing speed of 370 miles per second (600 km/s), or 180 times faster than the fastest jet on Earth. “I nearly fell out of my chair at the telescope when I saw one star change its speed by a staggering 750 miles per second in just a few minutes,” said Smithsonian astronomer Warren Brown, lead author of the paper reporting the find. The brighter white dwarf contains about a quarter of the Sun‘s mass compacted into a Neptune-sized ball, while its companion has more than half the mass of the Sun and is Earth-sized. A penny made of this white dwarf’s material would weigh about 1,000 pounds on Earth. “If there were aliens living on a planet around this star system, they would see one of their two suns disappear every 6 minutes – a fantastic light show.” said Smithsonian astronomer and co-author Mukremin Kilic. “If these systems are responsible for underluminous supernovae, we will detect these binary white dwarf systems with the same frequency that we see the supernovae. Our survey isn’t complete, but so far, the numbers agree,” said Brown.